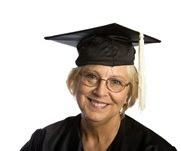 Advanced Learners Private Tutoring: Does today's BA = a high school diploma in 1970? Does today's BA = a high school diploma in 1970? And is an MA = to a BA just a decade ago? With so many people today receiving scholarships and grants to get a college education, there are a staggering number of students going to college for free or almost free. At one time it was enough to work hard and have a solid high school foundation to get a job that one might stay in for five to ten or even 20 years. But today we are on Disney’s “people mover of the future”. We want more, bigger, better, faster and rarely are we satisfied. Soon, you’ll be ordering French Fries from a guy with a PhD. Why, because everyone has a degree and there just aren’t enough jobs to go around. But of course, we are willing to pay $10 for a lunch in a paper bag that once cost $1.99, so I guess the PhD taking your order is getting paid well enough. Is there a stimulus plan for education?